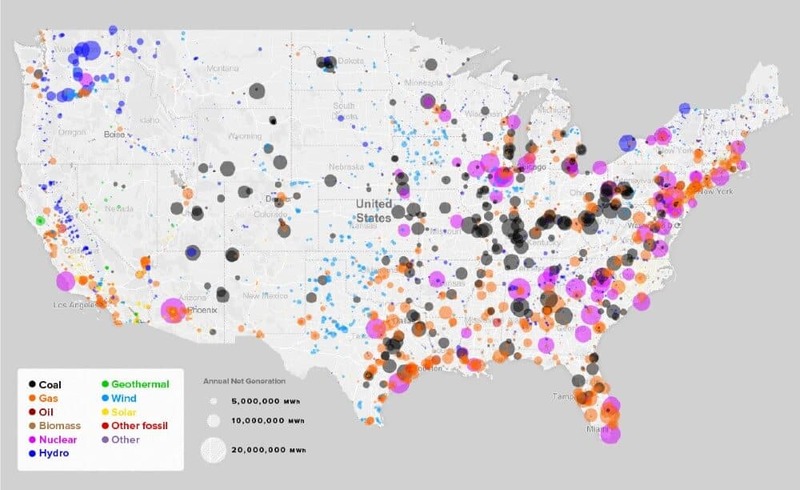 The map above shows where you can find each type of power station in the US based on energy source used for generating electricity. The data for the map is from 2016. According to the EIA, the US generates 4.03 trillion kWh of electricity annually. Natural Gas is now the top energy source at 32.1% of the total generating capacity, followed very closely by coal at 29.9%. Other major sources include Nuclear (20%), Hydropower (7.4%) and Wind (6.3%). Finally, while solar is growing, it still only accounts for 1.3% of large scale energy generation (small scale solar [e.g. rooftop] would increase this by around 50%). Whoa, whoa, WHOA! I was told that solar capacity has increased so much in the US that it has increased its share of production by 10x in the last 10 years!! Where are all the yellow dots? There’s something wrong here. My math tells me that if it increased its share by 10x, it could have only contributed 0.13% ten years ago. I remember purveyors insisting that their mature, advanced solar technology was going to revolutionize power production by now.